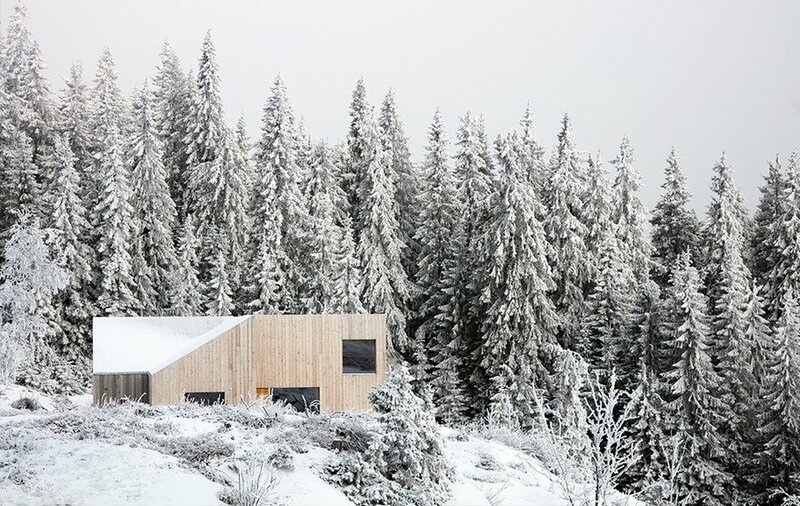 Mork-Ulnes Architects have recently completed Mylla, a compact yet expansive cabin north of Oslo in the Norwegian forest. 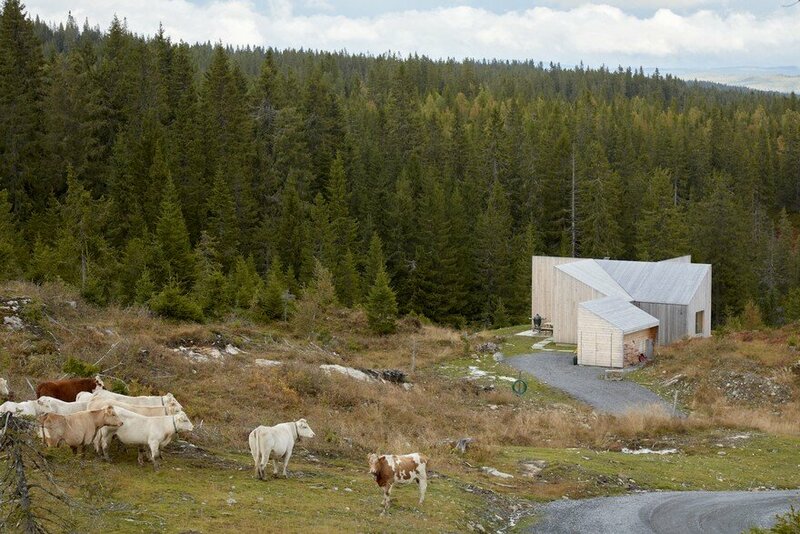 A retreat for a geologist and his family, the 84-square meter building sits firmly on a hilltop and is formed by the forces of the landscape around it. 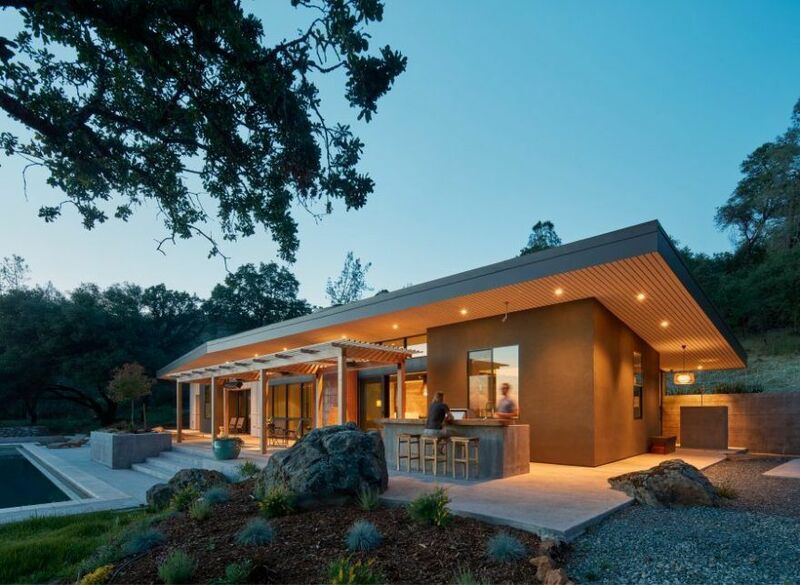 Mylla breaks apart the traditional rectangular cabin house plan into a pinwheel which radiates into the landscape to both frame four distinct views — Mylla Lake, the rolling hillside, the sky, and a towering forest — and to form wind- and snow-sheltered outdoor patios. The untreated pine siding is simple and honest, and registers the seasons as it greys and weathers with time. Scott Young and Christine Griffin Young are an American couple in their forties with two young children. Scott’s work as a geologist pushed the family to relocate to Oslo seven years ago, where they’ve fully embraced the outdoors-lifestyle of Norway. 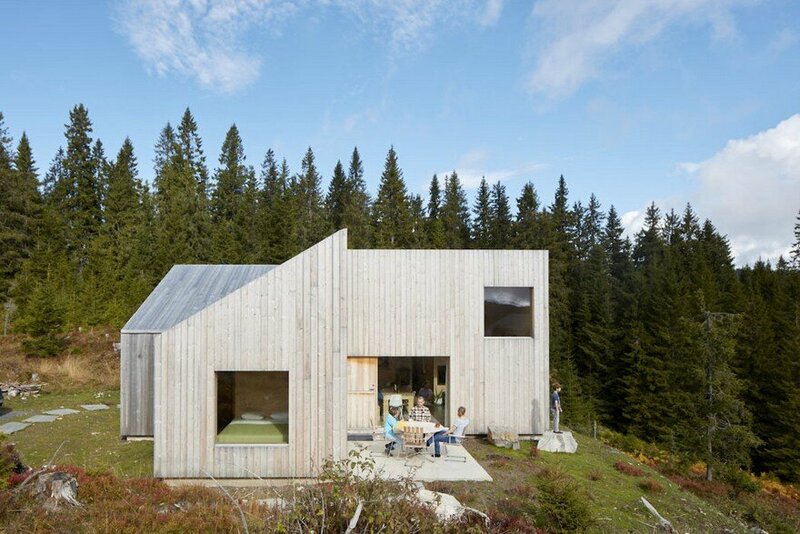 The site is located at the northern edge of Nordmarka, which is a vast wilderness just an hour north of where the family resides in Oslo. Though the landscape is still wild, it is easily reached by car, bike, or ski from the city. The location was chosen because of its proximity to Oslo and its easy access to cross country skiing and fishing, which can be done at Mylla Lake just below. It only takes a few hours to reach via back country trails on bike or skis, which Scott has occasionally indulged in, or just over an hour by car. “Amenities” that the Youngs requested at the outset were: three bedrooms, including a bunkroom for kids; two bathrooms as efficient and small as possible; a small annex for ski waxing, bike and ski storage, and a two person sauna; connection from inside to out. A distinct interpretation of the local hytte typology. Hytte is the Norwegian word for cabin. Hytter (cabins) are a huge part of Norwegian culture, with over a quarter of all Norwegians owning at least one. The traditional Norwegian hytte is small and primitive, serving a simple utilitarian purpose to shelter, often with an outdoor toilet and no running water. 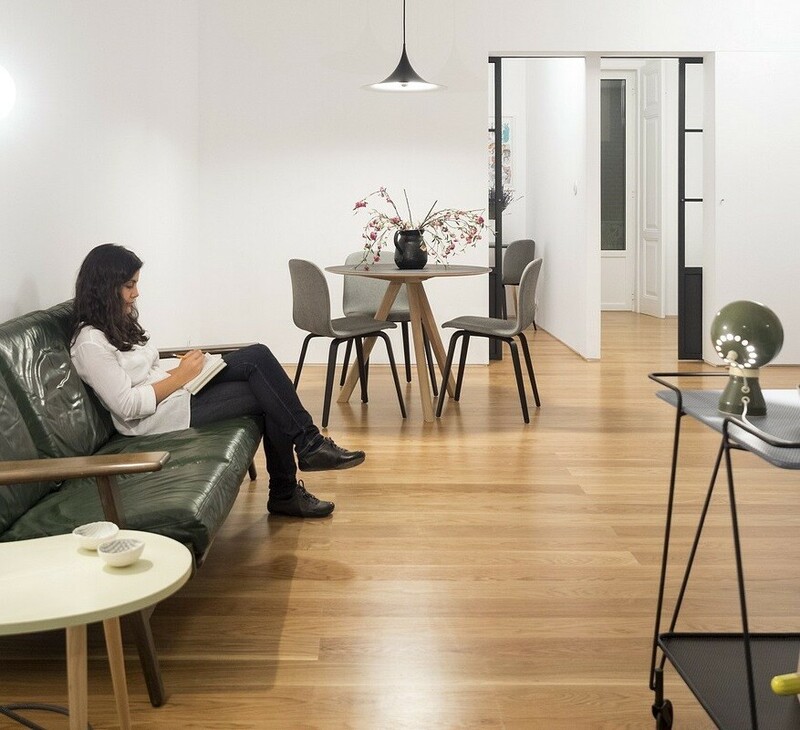 The typical interior is cramped, compartmentalized, and disconnected, with rooms loaded off a narrow corridor. The living quarters are usually dark with pine clad walls, small windows and low ceilings. 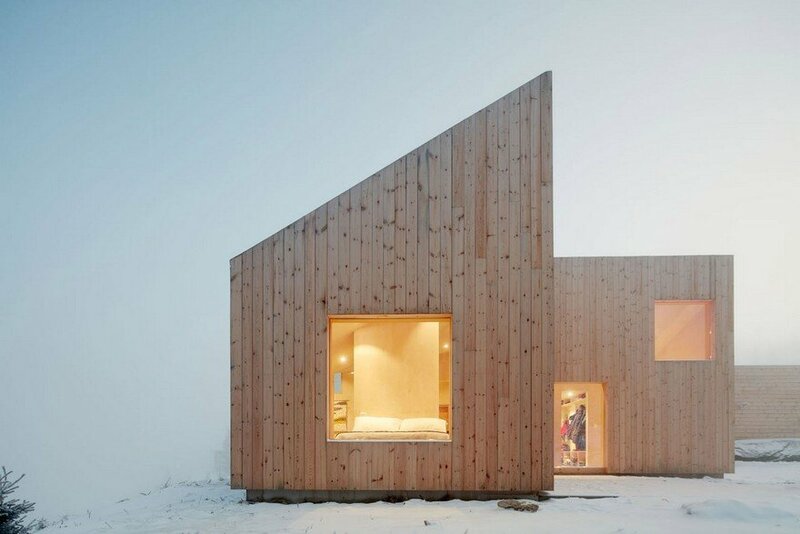 The design challenge was to rework the traditional hytte building type so that it still maintained its utilitarian character — compact, efficient, and driven by function — but to form the building in relation to its landscape and create an interior that felt more expansive and generous — and still included three bedrooms and two full (though tiny) bathrooms in 84 square meters. Though planning regulations required a gable roof, the architects were able to split the gable in half to create four shed roofs. This produced a pinwheel plan with two sheltered outdoor spaces — the Morning porch and the Evening porch — which capture the sun and are protected from wind and snow shedding from the roof. 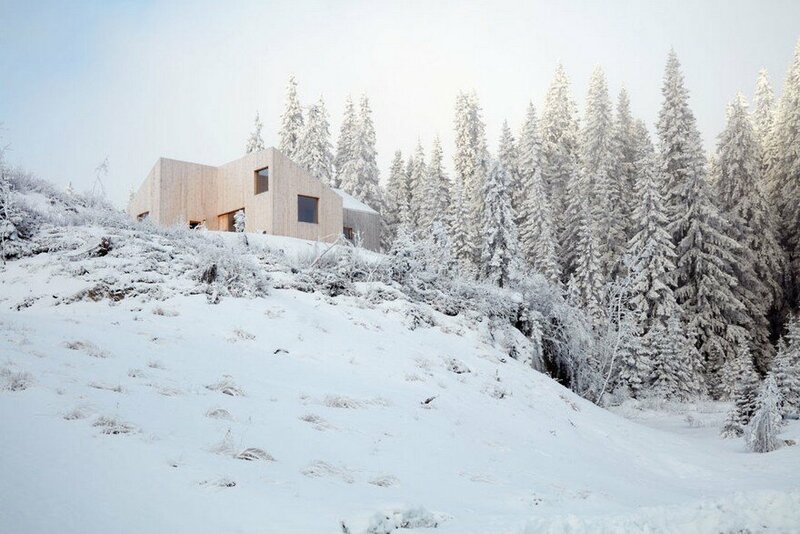 Instead of emphasizing the site’s sweeping panorama of pine and deciduous forests, mountains, and lake, Mylla Hytte takes a more deliberate approach to the landscape around it. The wings of the cabin house engage four distinct characters of the site: the great room looks onto Mylla Lake, the guest room looks towards the rolling hillside, the kids’ room looks up at the sky, and the bedroom has a private view of the towering forest. Rather than compartmentalizing the plan into a series of separate rooms, the interior of the 84 square meter cabin is designed as a free flowing landscape. The 2.4m to 4.3m high vaulted ceilings are continuous throughout to form a uniting canopy. Underneath the canopy are three functional cores — one for the kitchen, coat closet and bathroom, another for bathroom and storage, and another for storage and mechanical equipment — which direct the interior flow and create private zones in the interior. Close attention to detailing enhances the feeling of openness and privacy. For instance, each bedroom has two access doors as to not create any dead ends. 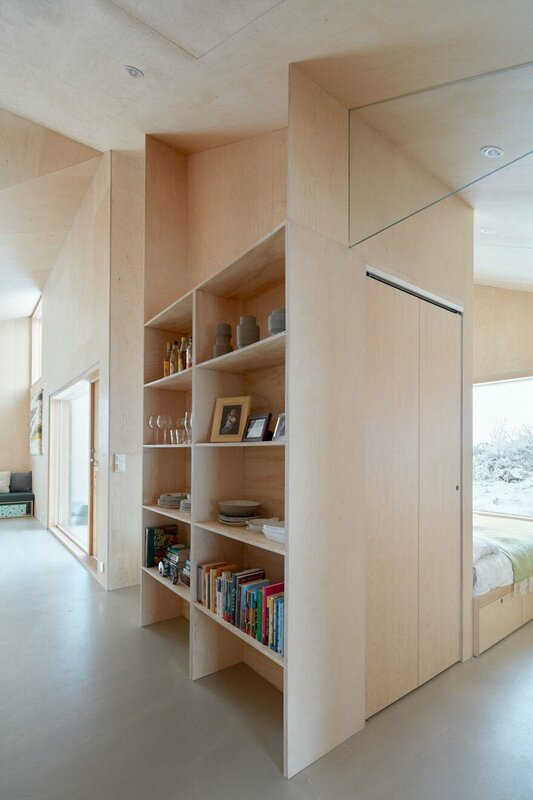 When open, these doors — made of the same plywood as the walls and ceiling — sit completely flush within a wall cavity so that they disappear. Above each door is a transom glass to reduce sound transmission while allowing the ceiling to expand uninterrupted across the interior. The architects built many models of the house to test their design ideas and approach. 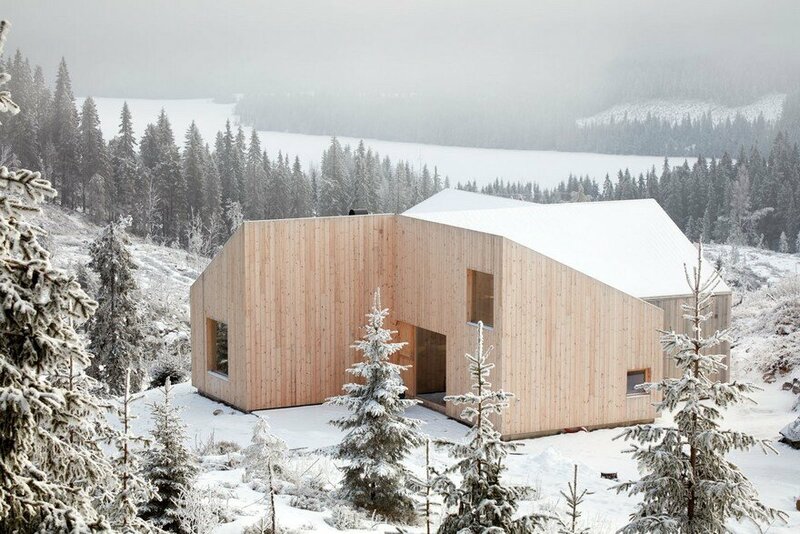 Special emphasis was placed on the design of the roof, not only from a spatial and aesthetic perspective but as a functional response to heavy snow shed in the area. 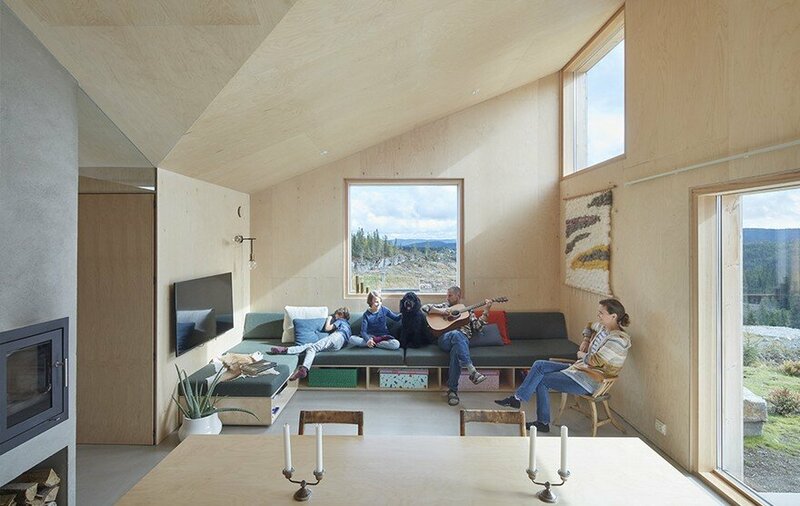 In the end, the small cabin house can comfortably accommodate the Young’s family of four along with 4-6 guests within its two bedrooms, bunkroom, combined living room and kitchen, two full bathrooms. 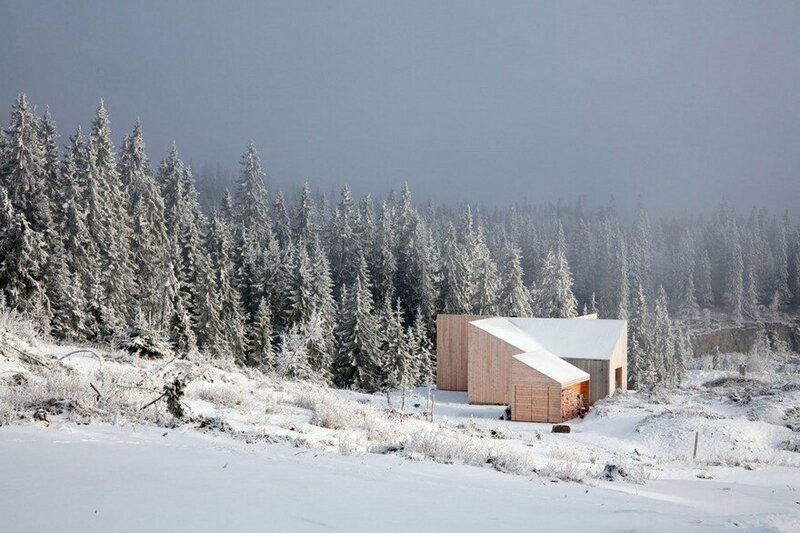 During the cold winter months, when the cabin is half buried in snow and the surrounding landscape is white, the family goes on long ski tours and warms up in the sauna afterwards. In the warmer months, the family explores the area on mountain bikes, canoes, and kayaks. Scott is an avid fisherman and often takes the kids out on Mylla Lake to find local perch and trout. A warm and efficient interior space. 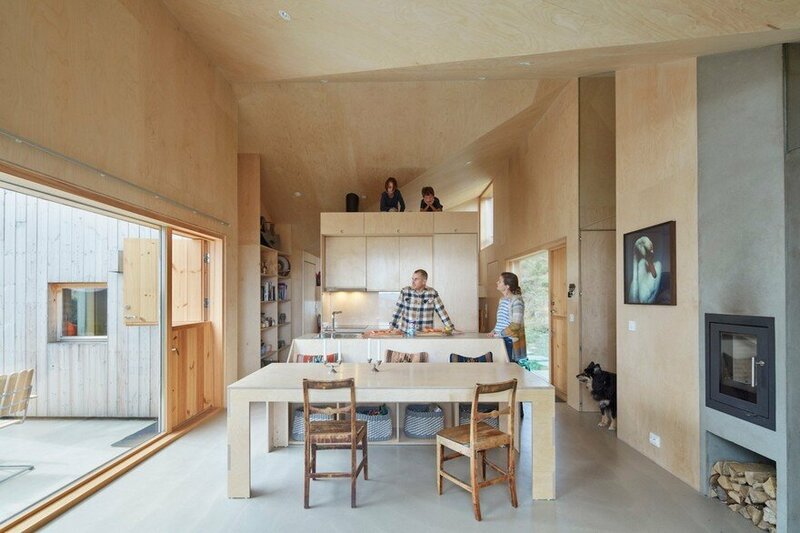 To create a warm and light filled interior, the architects used pine plywood treated with lye and white oil to finish the interior of the cabin. Custom plywood furniture, including bed frames, bunk beds, couch, dining table, benches, and shelves are found throughout. 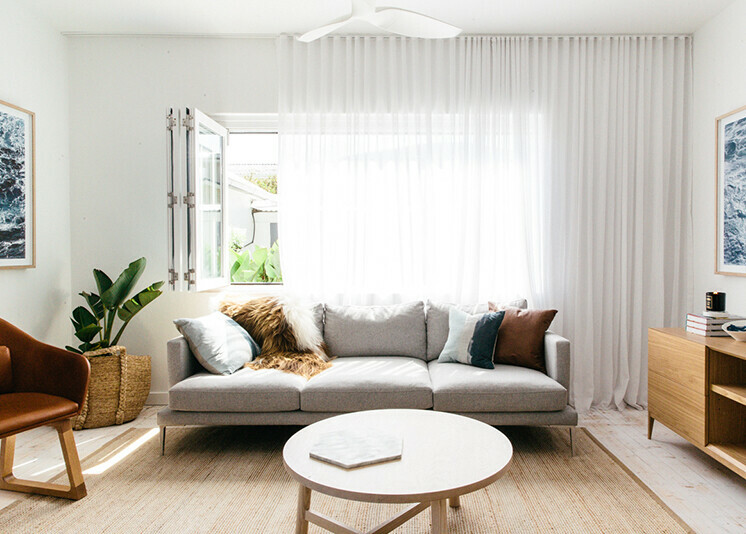 “We wanted to create a clean and simple interior so used only two materials for the interiors: lyed pine plywood and concrete,” says Lexie Mork-Ulnes. The walls, ceiling, and all furniture are plywood with exposed edges, and the floors, countertops, and bathroom walls are concrete. The custom designed furniture for this cabin house creates an inviting setting for the family and their guests, adding soft touches of forest with green Kvadrat wool felt for the upholstered built-ins. “The cabin is so small, we wanted to make things as multi-purpose as possible. The kitchen island is also the bench for the dining table. 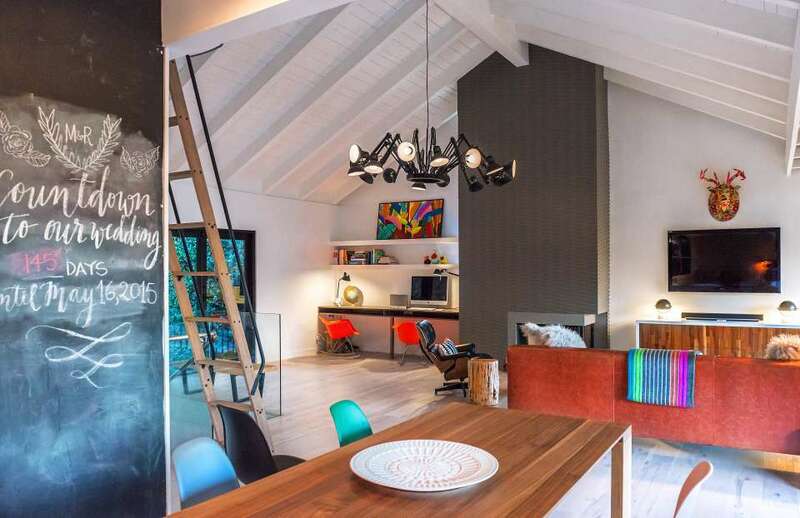 The roof over the bathroom volume is a playroom for the kids, since their bedroom is so small. All of the beds have built-in drawers, and the sofa has large cubbies for books and storage bins for games and legos. The sofa is made of two single mattresses, for easy conversion to extra beds when the house is full. We attempted to make the furniture as material efficient as possible, so for example the dining table is built from exactly two sheets of plywood,” adds Lexie Mork-Ulnes.